Farewell to the Other Space crew (for now?) as they head out on another adventure with Sarah Baker’s Klingon-Juggalo combo-alien. “Finale” was a particularly emotional episode as Karen believes she is about to say goodbye to her brother and childhood friend/potential lover forever as they embark on a mission to research their new alien find. That’s one of the strengths of Other Space as whole. Like other Paul Feig properties, there is a heart inherent to the show, and a true love between characters. They may get pissed at each other for allowing an alien to siphon off the ship’s fuel source, but in the end, they truly love each other. What’s odd about this deep abiding love these guys have for each other those is that it really only works in a platonic sense. Other than Stewart’s unrequited love for Tina, the romantic love stories on Other Space have universally not worked for me, so I wasn’t the biggest fan of the Italian restaurant subplot. It did not feel like an ending note, especially when everything that Stewart, Karen and Michael were doing felt like it was in service to the end. In “Trouble’s Brewing,” Michael and Tina’s affair was a function of the plot. The same could be said for Stewart’s crush on Tina. But, the Kent-Natasha relationship has never truly landed for me (although, perhaps seeing them be able to interact digitally may have changed that, especially with lines like, “Our time together has been the least tragic of my life”), and Karen and Michael’s relationship seems only to exist when it is convenient for it to do so. The basic chemistry of the cast allowed the platonic relationships to work while the short run of only eight episodes made any sort of romantic pairing seem rushed and out of nowhere. It makes sense that Karen would regret sending him away only after she’s let him go, but their relationship did not have any time to grow. I don’t mean that in a depth sense but in a comedic sense. But one aspect about the finale that I loved was Stewart’s desire for adventure. Why are they here if not to explore the great beyond and try to gain new knowledge? That speech was, in a way, coming from the voice of the sci fi fan just as it was coming from Stewart. We’re here to see something new, to explore new world, we can’t give up this opportunity. It’s one of the only times Stewart has displayed the capacities of a traditional leader, making his crew understand his desire to possibly risk his life in order to understand the unknown. The finale was clearly meant to signal another season, with their chances at going home dashed and Baker’s alien’s stowaway status prompting them to run. Even with one line, I wanted to see more from Baker. On though whole, though, I’ve enjoyed the run of Other Space, it was slight, yet funny and sweet. And while I don’t know what it would have looked like over a 22 episode normal season run, I can see why this would not have necessarily worked on network TV. It’s a closed show, every episode is a bottle episode in a sense, and there is little room to introduce new characters (it obviously could be done, but it would be a more difficult endeavor than a normal sitcom where characters can come and go). 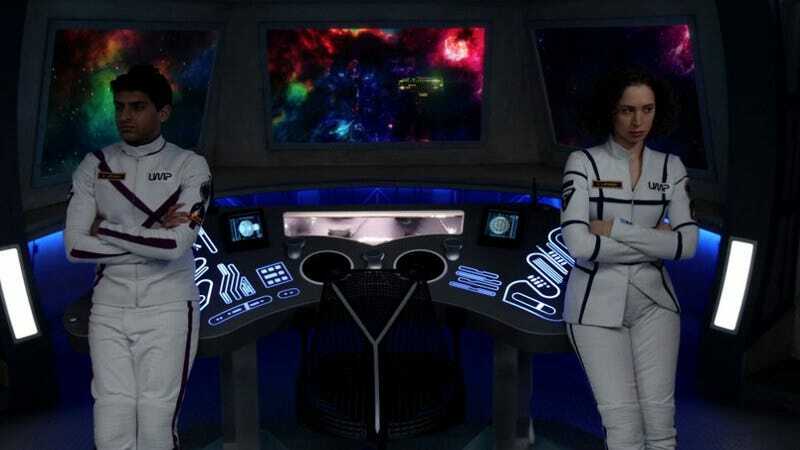 But the real boon of Other Space was allowing for some fresh faces to get their chance to show off what they can do with special shout outs to Karan Soni, Milana Vayntrub and Neil Casey, who consistently kept me giggling.